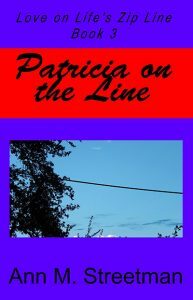 Patricia on the Line is Book 3 of Love on Life's Zip Line. This is the story that inspired me to write the series. In fact, I started writing this book before Book 1 and Book 2. When I was confident I could fully develop Book 3, I stopped and started writing Book 1 and Book 2. Then it was time to finish Book 3 with a flourish. To be honest, John Donaldson is my favorite character of the series Love on Life's Zip Line. It is his wisdom gained through mistakes and perseverance that inspired me to write the series. He has an important role in all three books, but he is front and center in Book 3. Likewise, Patricia, his former wife, is in all the books, but now she experiences Love on Life's Zip Line for the second time. Patricia's mother, Georgia Hanson, has a small role in Book 1 and Book 2, but becomes a crucial character in Book 3. I like Georgia so much that I might write Book 4 for her. Might, I said, might.